A little bit of history about the distillery, One Eight Distillery is a newcomer to the beverage scene in DC located in the rough parts of Ivy City. A mostly industrial and very poor part of the city, has seen some resurgence through gentrification and some brave new businesses. 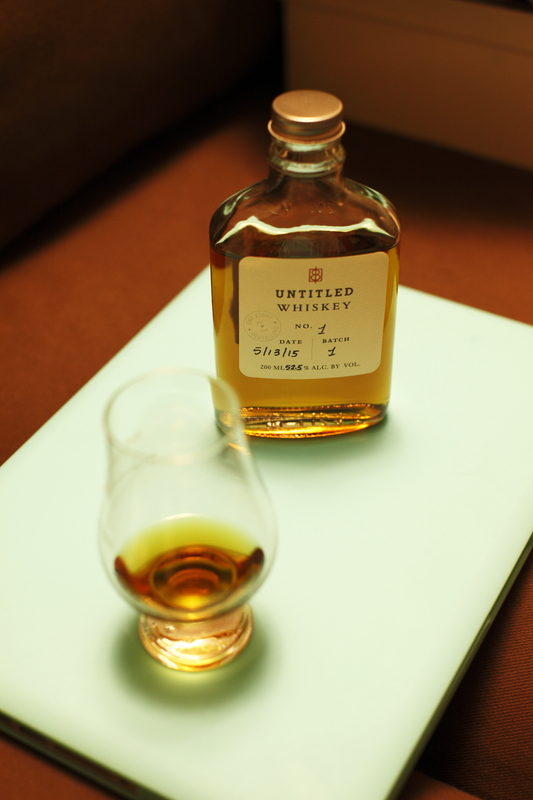 One Eight’s first foray into aged whiskey is called “Untitled Whiskey No. 1” and it comes from 9 year old rye distilled by the MGPI distillery in Indiana, which has been around since 1847 by way of various owners. There are many companies that have used the hooch created by MGPI, High West, Willett and Templeton Rye to name a few tasty ones. One Eight Distillery then takes that 9-year rye and ages it for another 3 months in 30-year-old Oloroso Sherry casks. Then they bottle it up and slap a label on it. How is it, you ask? It has a prominent blast of rye spice right up front. Vanilla and caramel creep up lightly behind the spice, along with sweet tobacco. The addition of water brought out a beautiful caramel and vanilla flower perfume and reduced the spice notes. The rye spice fills the mouth and is then met with dried orange peel, slightly peppery and cooling menthol tobacco. A very hearty whiskey at a very well controlled 52.5%. The sweetness no doubt brought into play by the Sherry cask finishing. The addition of water didn’t really make a positive difference to the whiskey. It seemed to water it down and thin its flavor. After tasting while nosing, I can feel that my lips are sticky and noticeably sweet. It doesn’t have a sweet finish but rather a sustained mellow sweetness. The rye spice continues for a good while. The combination of the sweetness, spice and heat make a pretty darn good whiskey. I’ve tried a lot of the beers, breads, and booze that have come out of DC and claimed the district as their home but this has to be the best representative I’ve had. The interesting rye spice and Sherry finish make this a bottle to look out for if you ever see it at your local stores.